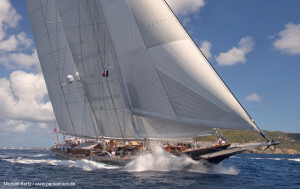 The SuperYacht Racing Association (SYRA) is a non-profit organization establish in May, 2011. Membership is open to any superyacht owner (or owner’s representative) who participate in superyacht regattas, superyacht event organizers, and superyacht industry related companies. These companies include, but are not limited to designers, builders, sail makers, insurance providers, spar and winch manufacturers. Why a SuperYacht Racing Association? This organization was formed for a very simple reason: “to enhance the enjoyment of superyacht owners”. Safe racing and fair racing are very integral to the enjoyment of yacht owners. In fact, it was safety concerns and a very serious injury while racing that led to preliminary discussions and the initial meeting in London in November, 2010. Addressing both of these complex issues is a major undertaking for SYRA with safe racing being the top priority in year one. At the present time the association is an advisory and informational organization with the potential of dictating policy in the future. What are the Missions and Goals? • Ensure that the interests of yacht owners and organizers are being heard and best served by inviting and encouraging member participation in all committees and established working parties. An exploratory meeting was held in London in November 2010. Ed Dubois organized an all-day gathering that was attended by no less than 10 yacht owners/representatives and 30 industry players. It was agreed that as the superyacht racing arena has expanded quite significantly, both in the number of events and competing yachts, the issues of safe and fair racing are increasingly important. A working party was formed and chartered with the task of defining the next steps and goals. The purpose of the follow-up St Barth’s meeting in March was to determine whether there was sufficient interest and consensus to form a SuperYacht Racing Association (SYRA). Items presented for discussion by the Working Party included membership, scope of work, composition of an Executive Committee that would include hiring an executive, a Mission Statement and funding plan. Those attending agreed, by a show of hands, to form the organization and to hire Peter Craig (Marblehead, MA USA based president of Premiere Racing) as the SYRA Executive.